This cage comes with a crystal of your choice. 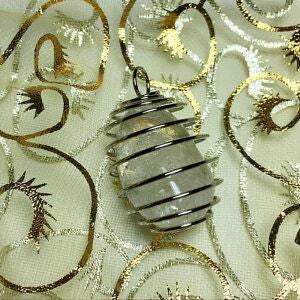 The cage is a flexible coil that allows you to change any crystal you would like it to hold inside. Use the menu to choose the type of crystal (3/4 -1") you would like inside the cage. *See options below. Your necklace will arrive in a mesh pouch. Cage is about 1 Inches long and Comes with a Silver Metal Snake Chain with a 18" long and 1.5mm thick. *Gemstones available include: Amethyst, Banded Amethyst, Green Aventurine, Yellow Calcite, Botswana Agate, Carnelian, Citrine, Clear Quartz, Fluorite, Mookaite, Hematite, Howlite, Labradorite, Leopard Skin Jasper, Red Jasper, Rhodonite, Rose Quartz, Selenite, Smoky Quartz, Sodalite, Tiger Eye, Snowflake Obsidian & Black Obsidian. I bought the crystal cage and selected the surprise stone feature and i absolutely glad i did, looks like i got snowflake obsidian and after reading up on it, im so glad that one was sent to me. :) always happy with my purchases! Exactly what I ordered. Perfect size.